The bus was about to leave Utrecht. But TestBash was in Utrecht. I politely asked the bus driver about my bus stop again. He put the blame on the broken system in his bus. I had a workshop to prepare, mate. With a rapid approaching workshop I tried to get a good picture of the room. Okay. 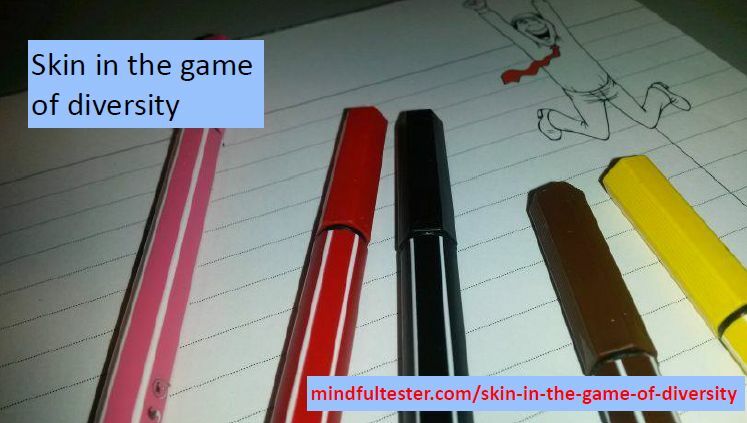 10 people would attend my workshop. I expected more. After digesting my disappointment I looked at the bright side: I could handle them. Then slowly stress was getting me. On my shopping list for my workshop were a beamer and a screen. Huib mailed back: there is a screen. You do not need a projector. So I repeated my request. The reply was to attach my laptop to the screen. I was puzzled. It took some time to realize it was a flatscreen. As a speaker I was allowed to participate in a workshop. I selected Gitte’s in the afternoon. Then I got curious: was there a way to get more information about the morning workshops including my own one? I clicked. My workshop was sold out. Wow. Excuse me. Just had another look. My workshop was sold out. I freaked out. Back to the workshop day. After the scenic tour with the bus I involuntarily extended it. Using a public traffic app I located the street after some backtracking. A short walk later I saw a place. Wrong place. The venue should be, where the foreigner with the small backpack was heading to. He was out of sight. So …. I had passed a church. You’re kidding. Outside was a banner with a 7. The venue had a 7 in the name and it was situated at no 7. I entered the building and saw Rosie. Bingo. I got my ninja sticker and was ready to prepare my workshop. Huib provided the paper, markers and stickies. And up we went. He entered a lovely room. Ideal for a workshop: tables and chairs. Just, what I had in my mind. “You have another room.”, Huib remarked. Other pleasant thoughts about the room were immediately muted. I ended in a small room with one big table. A door with a glass plate on top of it. Good enough for an agile tester. There was a facility manager, which was quite convenient. “We’ve got HDMI.”, she proudly announced. I showed her the side of my laptop. “I need VGA.” And off she went. Returning with some fancy connector. Sound was also difficult. The line from the connector was too short. A box was brought up. “Do you need something?”, the lady informed. I prefer to have my laptop in front of me, so I moved my laptop and the screen. After some shuffling I had my preferred position for my laptop on the big table. Then this table became my next point of concern. 10 people would attend my workshop and I had only place for 9. Big sigh followed by moving back all stuff in the old position. Already some attendees were present for half an hour. I apologised and continued with my preparation. I got a glass of coffee from a member of my audience. Cheers mate. At the end I connected the laptop to the screen and saw a black screen. It was time to start the workshop after sending a HELP request to facility management. The atmosphere was a bit spoiled by moving all that stuff. I had partial fix by connecting my smartphone to the box. Hopefully the music had a calming effect on the audience. So I started my workshop to talk about visual testing. Why I thought, it could use some attention from testers. The facility manager came back. And solved the problem with plugging an USB connector. I should have noted that connection. A photo was faster. Exploratory workshop preparation anyone? Anyways my presentation was shown on screen. Now I really could start. I used some tricks to get interaction with the attendees. Within 10 minutes I got verbal feedback on several questions. Then it was time for the time out exercise. It was a tough one to do. Paper and stickies were scribbled upon with markers. I saw people stopping and staring. I showed the next slide and explained the next step. The advantage and disadvantage of a visual testing is, that I can notice progress in a few seconds. “Take a new piece of paper and start again.”, I encouraged the attendees. People stretched their arms for the paper. After a few minutes the cycle of explaining and exploring restarted. Slowly the result ended in a state transistion diagram. After showing the diagram I rattled off all missing elements in the model. Then I justified my choices. On the flip chart I wrote YAGNI, You Ain’t Gonna Need It. This principle of XP, Extreme Programming, could also be used in testing. Why should I describe all details in my model, when it does not really add value? Looking back I should have switched the time out exercises. Real life examples are pretty nasty. There was a break after 1 and 1/2 hour and I just had finished the first hour presentation. 2 hours to squeeze. I just entered the second hour presentation. I already skipped 2 exercises. This was going to be tight. On the other hand Huib granted me extra time, because the lunch would take place in another workshop room. After the break I started with another exercise. People used state transition diagrams and process diagrams. I was really happy, that they made a visual model. 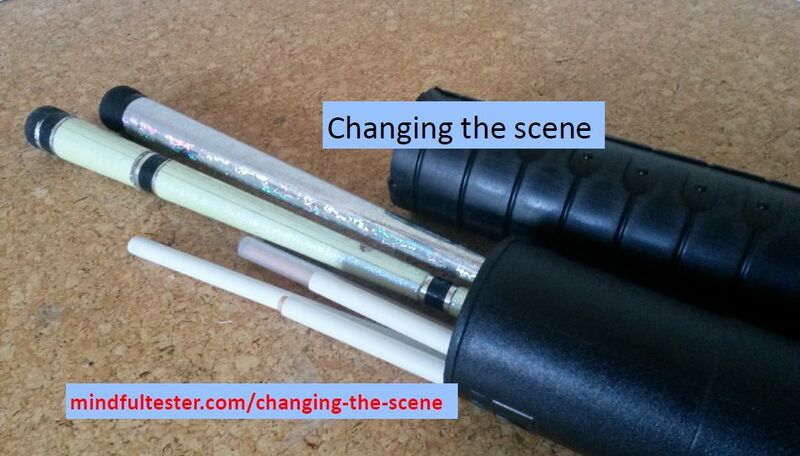 During the last part of the workshop I focused on the most important parts of a new visual model. And I succeeded. In the weeks before the workshop I memorised the mind maps of the hour presentation. I had looked to supporting stories and slides twice a day. It benefited me greatly. During my workshop I remembered, that test ideas could be found using SFDIPOT. This powerful heuristic almost cost me a quarter of an hour. I just skipped the explanation: I wrote it on the flip chart – “Just search on SFDIPOT.” – and moved on. That evening I had a talk and a few beers with Klaas. He also used it frequently in combination with FEW HICCUPPS. FEW HICCUPPS is another heuristic. Should I use his advice? Does it count, that he is a world champion in testing? Great, extra homework for me. For one exercise I needed the Wifi. Every attendee needed only 20 kb. It was too much. Huib had already mailed me several warnings: the wireless network was not fit for workshops. Ofcourse I had taken measures: I made my smartphone a Wifi hotspot. Within minutes every attendee was on the web. Later in my workshop the screen went black. One of the attendees pointed at the loose adaptor. By all the moves of my laptop I forgot something to connect. Oops. I plugged my laptop to the electricity net. It was time for a Fieldstone. I had a small role playing game or RPG. “If you are familiar with Fantastic Beasts and Where to Find them, he looked like Mewt Scamander.” And I let the game begin..
After the RPG I saw the login screen. I switched back to presentation mode. The workshop had to be finished in an appropriate way. I still had so much tell. I picked the Fieldstone with the Pendulum. A few weeks before the workshop Katrina had written about a pendulum. She used it to illustrate to find the optimal way of testing. I could not find my props, so I used the mouse. On the flip chart I wrote too deep and too shallow. With my left hand I held the tail of the mouse. The right one grabbed the mouse and rekeased it at “too deep”. The mouse moved in arc until it lost all its speed. This was the optimum for testing. In testing a lot of words are used. The trick with visual testing is to find the right balance between no pictures and too many pictures. During my preparation I remembered Nassim Taleb telling the essence of Antifragile standing on one leg. I had the feeling, that I had done the same. Or was he really thinking about information, that could be shared? Our conversation continued about the small things which improved the life as a speaker like an available presenter. A click on a button of this laser device shows the next slide. In the workshop about courage Gitte gave me homework. “Write on a paper the first step of something you are going to do next week.” It was about something that would require courage. The week after TestBash I wanted to write about meeting people. Was there a way to change my way of blogging? I focused on what I wanted to share. It was basically the feelings and thoughts I had. There was no test knowledge I would share. Was there a message I could share? Yes. Meeting peers is great. Surprises are great. The test community is .. you got the message. I started with a mind map. Then I added notes. I made a funny picture. I gained more and more speed. The result was the previous blog post BTW. Soon afterwards I started this blog post. 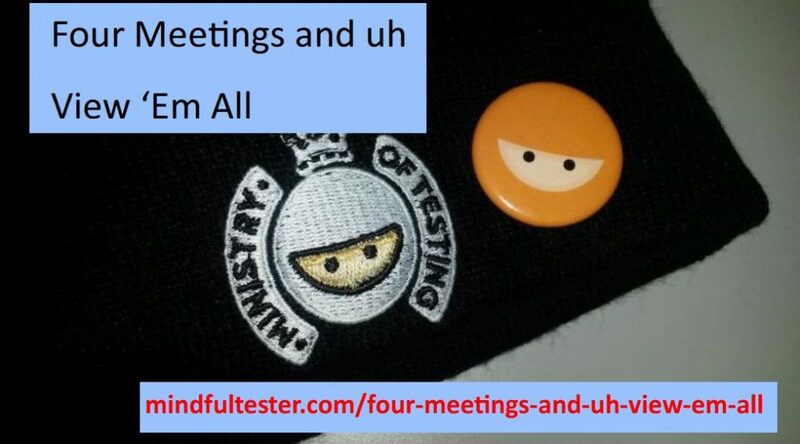 All kinds of memories about my speaking experience at TestBash I put here. Piece by piece. Day by day. The conference day started a bit unusual for me. “Welcome mister speaker”, Huib said, followed by a bow. How did they recognise me? So on the conf day I asked, whether the colour of my ninja badge had an extra meaning. E.g. Talk in black. Workshop in green. Silver for free beers. Etc. Actually there was no silver. Mind you. There was no connection between colour and role however. Maybe a Chinese with a Dutch accent is associated with a speaker. Or people actually recognised me from the program. Or I was carrying simply too much stuff in a backpack and case on my back. In a room filled with goodies I got my badge of honour, a T shirt with a golden Ninja. I hereby can confirm there is a connection between the golden ninja and the ministry of testing. In the afternoon other people started to like this tweet. Some of my testing muses did. For a short period I was energised and then drained afterwards. I told him, that I was surprised about the progress during the exercises. I could solve exercises from my workshop within minutes. He remarked, that it was all about the zone of proximity. It is easier for me to transfer knowledge to someone, who has the same experience or only a few years experience less or more. She or he is in my zone of proximity. This meant, that it would take me more time and effort to teach people, who have significant less experience in testing. Within an hour I had a new follower on Twitter: a German guy, who had written a respectful blog post about the test pyramid. He looked somewhat familiar. And I had talked to him. “Yes, you were not on the list.”, I replied. “I encouraged her to submit.”, Huib admitted. During the last break on the conference day I saw Manon sitting in the last row. So I informed about her workshop. We talked about tables and Wifi. Pieter and she had set up their own network. Another way to address a workshop risk. Jack in the box. Check. After the break the audience was asked whether they had switched places. This conference was a way to meet other testers. I had moved from the front row to the back row. Thanks for the invitation Huib and Rosie. 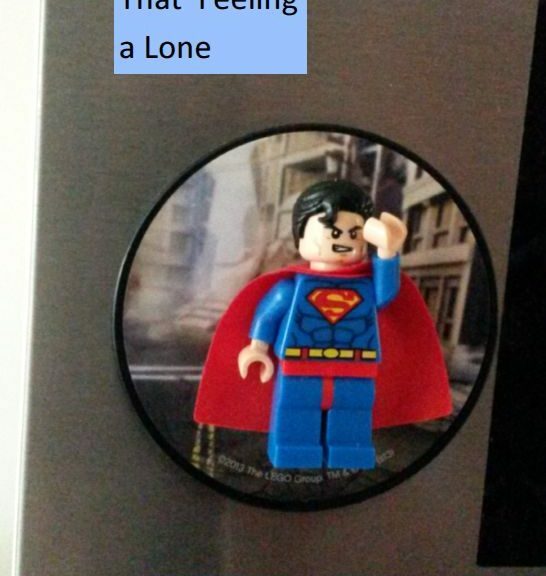 Just before the Lean Caffee I saw one of my Twitter heroes. I stood up and shaked hands with Patrick Prill. And I could not remember it. Hmmm. During the Lean Caffee I was tapped on my left shoulder. Curiously I turned my head to the left: nobody. O yeah, that old joke. I turned my head to right seeing Bart Knaack smiling. Still in for a joke. Always nice to meet him again. “@MIndfulTester.”, I answered in a neutral tone. I loved the positive energy, which I felt. But I was puzzled about the reasons. Somehow I was more surprised about this fact than our little chat about TDD. Did I ever spend hours on a presentation? And my own money on traveling for this talk? On top of that vacation leave? Yes, I did. When I talked about it with other speakers, it did not get even better: astonishment or silence. In the second year of this century I was a volunteer at the European Juggling Convention in Rotterdam. This low budget convention needed volunteers to break even. So I paid for the convention and spent hours to help the organisation. Afterwards they paid any costs I made including the convention ticket. My badge of honour was and is the crew T shirt. Being invited to speak at a test conference is considered an honour between testers. An invisible, but mentionable badge: I got congratulations. On a conference people shook my hand and wished me success with my talk. There are several privileges for being a speaker. And still recognition in words may not be enough. Bills have to be paid. I was never hired, because I was a great speaker. Or an engaging blogger. In 2015 Eindhoven University of Technology introduced the Nanny Fund to pay costs for children of employees attending conferences. This year I changed my lifetime goal to give a half day tutorial on a specific test conference. I am still grateful for writing all my refused proposals. I learned to make better ones, My employer will cover some conferences and trainings, but as a born Dutchman I had to look at the costs. This bold move was possible thanks to Maaret Pyhärjärvi, who made a spreadsheet. It is an overview of costs being paid by the conferences. The next step was to look at delegate reports. What makes this conference great? How is the atmosphere? Can I learn there something useful? Do they share the same humour? Basically where is all the fun? This year Eurotesting Conference will cover the travelling costs of a first time speaker to a major test conference. During my holiday I was challenged. Just search on #30daysoftesting on Twitter. For one task I had to find an inspiring quote. That was difficult. I could browse blogs and books from famous testers, but that would probably not lead to a unique quote. 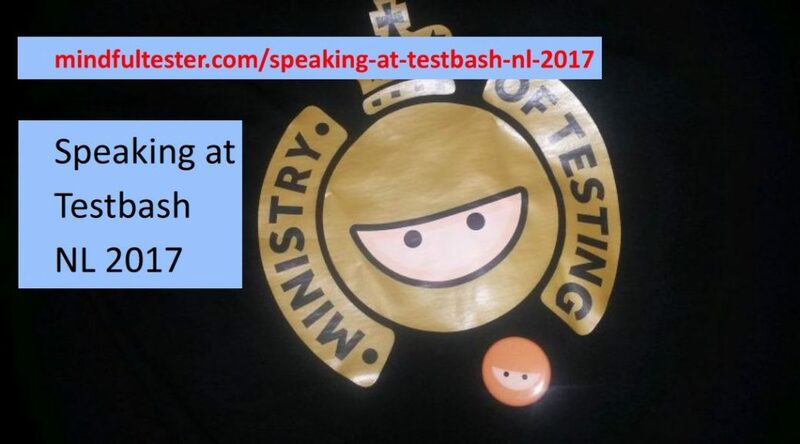 A month later I was writing a proposal for a workshop for TestBash Netherlands. I was questioned to describe myself. Normally I would use a lot of credentials. I remembered my Twittered quote. Now I used humour to convince the program committee. In August I got the news, that my half day workshop was accepted for TestBash. My adjusted life goal was sooner than I thought. And a bigger challenge than I had anticipated. Some Huib used the word awesome to describe the line up. 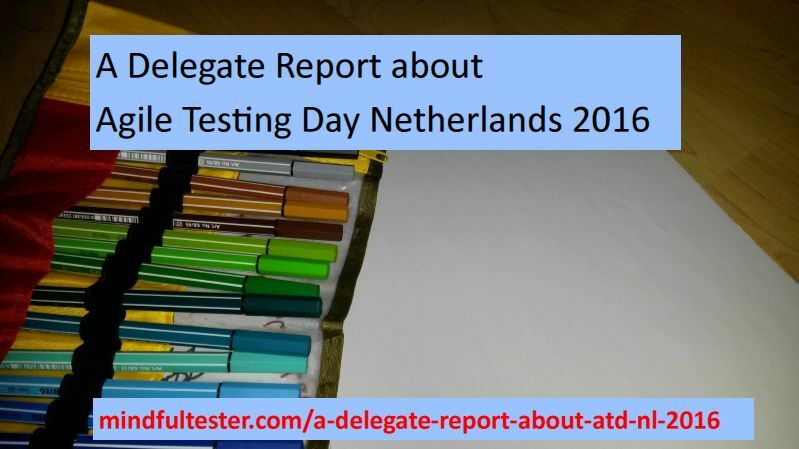 This year EuroTesting conference interviewed every speaker, who had sent a proposal. “Yes, you were not on the list.” I replied. When My Old Love came to the Netherlands, I just wanted to go. Months in advance I had been notified, that Almere was the place to be. I know that this place is lying about 3 meters below sea level. I live more than 6 meters below sea level. So no problems with the change of level. As I was writing, I wanted to look at My Old Love. My wife was all business. I had to ask her, if I wanted to go. Of course she would accompany me and the kids were also going with us (for good measures). So we were going to My Old Love, the European Juggling Convention. This yearly gathering of jugglers attracted more than 5000 visitors with interest in juggling, the art of throwing and catching things. Stocked with juggling props we made our way to the EJC, European Juggling Convention, 2016. After parking the car we had to walk to the convention site and buy some tickets. Then my wife wanted to have a look at the whole site. I just wanted to juggle. After more than fifteen minutes we finally sat down. I started to change clothes. “What are you going to do?” my wife informed a bit concerned. Decades ago I lived in Delft with my juggling book. I was still making progress, but it was difficult. I needed space. A place, where I could juggle without the concern of breaking stuff. To my surprise there was a weekly juggler meetup in my very little town. I contacted the organiser and became a member. The costs were low: a small contribution for the gym rent and I got free advice for juggling. Within a few years I became the meetup host. Mike and I were the key holders. It was our task to open and close the gym. Soon things changed: music, a break with coffee and tea & a good atmosphere. This was a place to learn. It was a safe place to juggle. No hecklers included! For me it was not an honorary job. It was about providing a place to meet other peers. To exchange ideas and learn about software testing. Let’s go back to My Old Love in Almere. After the lunch I switched gyms. I wanted to meet other devilstickers. Usually I give devilstick workshops on juggling conventions, but a last minute workshop would go unnoticed. I already spotted the workshop schedule though. So I made contact in another way: find other devilsticking jugglers, devilstick, and exchange tricks. I found a small group, who swapped tricks. I showed some tricks and learned some tricks. Thanks Philippe for your patience and teaching me a new trick. Back home I realised, that the European Juggling Convention had not changed. People juggling hula-hoops and kendamas were welcome. It still is a safe place to learn and practice. There are some main stream test events, which I cannot ignore. I just need to be there. 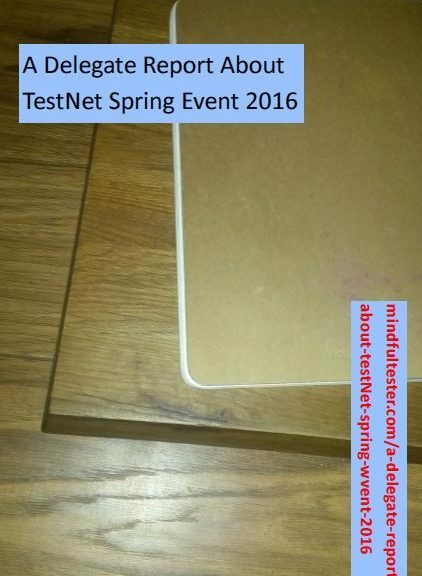 Enter TestNet Spring Event 2016. The Dutch Special interest Group in Software Testing, TestNet, had another free congress for his members: workshops, lectures, meals, etc. from 9 am to 10 pm. All for a yearly contribution under 90 Euro, which also includes an Autumn Event, peer meetings, and a congress with sponsored workshops. Did I mention the working parties? It’s not cheap, it’s good. Disclosure: I confess that I was a board member of this SIG, your honour. In order to illustrate his points he had nice examples with lots of interactions with the attendees. Pairing was useful even with different roles. He asked a programmer during a review about the code. He knew that he would ask irrelevant questions. And still there were some moments of hesitation and insight from the programmer’s side. He also worked for a Police project. The agents needed a handheld device, which could be used in a simple way. My first reaction was unbelief, until he explained the context. If an agent talks to a possibly dangerous person, he /she wants to watch the person all the time. The same with a victim. Eric had a preference for good documentation. Not only for the dreaded audit, but also for helping team members. An attendee asked why the documentation was not in the code. Eric responded that the documentation was also used by end users. Then he described the reaction of an agent looking at code. With all kind of tools available he described, what happened, when test cases are attached to Jira tickets. A rather unpleasant task indeed. He advocated Confluence for test case administration and Gliffy, an add on for Confluence, to make process flows in order to track the test coverage. Eric ended the story with coaching. How to make people better scrum members. Ingo Philip is an employee of a test tool supplier. I groaned inside. I was sitting in the front row and suppressed my urge to flee to another session. Ingo promised, that he would not mention his company again. I relaxed a bit. Ingo remarked that there were redundant test cases. The basic cause is user stories, which might have overlapping acceptance criteria. These had corresponding test cases in turn. So he suggested to consider functionality grouped test cases. While blogging I started to miss a process flow test or data flow test. Next he suggested to look at patterns in the past. Risk analysis was a helpful tool. For each feature good risk coverage should be obtained during testing. In an example some features had risk coverage of 50 %. Nice for statistics, but pretty abstract for me. Then I added all risk coverages of the features and got a result over 100%. That was the moment to raise my arm for a clarification. Ingo noticed me and delayed the question to the Q & A section. Heading towards the wall he described how test cases could be weighted using information from the past. He turned the steering wheel a bit by pointing out that deviations could not be predicted. Then unexpectedly he mentioned Exploratory Testing as a good supplement for test cases. ET could address unseen or other risks than test cases. Just missed the wall by a few nanometres. In the last part of the talk Ingo described a case about a regression test: test case reduction using the previously described method including the risk coverage, automatic test data generation, automated tests in several forms and frequencies. I recognised a pattern of another talk: determine a small set, which can be used for a fastback feedback, and distribute the tests over several servers to reduce the execution time. At the end I finally got a chance to ask about risk coverage. I picked up factors like frequency and potential damage, then the facilitator stopped the explanation. Ingo gave me an invitation to go to the booth for more information. But I came for the talk. His talk. time to leave the premises. A few things to mulch about. Or blog about. A few weeks ago I had ordered the afternoon ticket which included the last sessions of the afternoon, a dinner, and the evening sessions. (I am still figuring out, what an afternoon actually is.) A complete day filled with sessions would spoil my appetite for knowledge. One of the strangest elements of the conference was the Open Space. It was a group of testers looking for answers and testers willing to share those. It was a setting requiring special attention and a good moderator. Alex Schladebeck took her role seriously by pointing out the rules (Look mom. Without slides!) and using her candour to illustrate several examples. With more questions than available slots two groups started discussing their questions separately. Once again I noticed that there was not a single right answer. Looking at the context was very important. Attendees go to a conference to get more insights or answers for questions. And an open space is a safe environment to exchange thoughts with other peers. Thom Bradford is An American in Berlin. He was using cue cards like Gambit. No special effects were used, so the stage was not damaged during his talk. He recalled his last decades as a software engineer, who had some unpleasant experiences. It was obvious that he was reluctant to switch company. It led to the following situation. He had to break mastery: he showed Clojure to appalled Java programmers. Thom had real doubts about code coverage as KPI or Key Performance Indicator. During the presentation he started an automated test, which showed an impressive 100 % coverage and only positive test results. Clean Code and TDD were better than code coverage. This sounded like a SOLID advice to me. (Pun intended). Emanuil Slavov had somehow dehydrated his ATD 2015 talk to 30 minutes. And he had more to tell than it was humanly possible in the allotted time slot. So the speed was really necessary. It was Flash as a Speaker. With impressive numbers he showed the reduction of automated tests from 3 hours to 3 minutes. A lot of measures sounded logical in hindsight like a separate test environment and a test database, which had a minimal set of records. There was also an unexpected (temporary) setback like moving to containers. I had read only one. Number 3 was unexpected. “This session will be more technical than the previous one.”, Christoph Lukas began. Infrastructure as a code has the same characteristics as code. Using TDD he first developed a test. The first test run led to an error. Of course! Nothing was executed or set up. Using a flurry of Xterms (?) he slowly built the desired environment with components. Mark Winteringham introduced the delegates to Postman, which can be dowloaded for free from getpostman.com. This tool looked to me as a small and compact tool. Ideal to explore the interface. In the briefing Mark explained, how http is used. He introduced his thoughts about web testing and then encouraged the attendees to go postal on an example web service. Because of some technical restrictions I paired with another tester. I fell in a familiar trap: test without note taking. Mark did a debriefing which provided a decent way to catch up with my notes. In between I discussed the use of SoapUI with another tester. It was a more powerful tool with a subscription. In the last keynote at 08:15 in the afternoon Bart Knaack and James Lyndsay had a look at the latest hottest topic IoT or Internet of Things. Or Ignore other Things :). They started to model the internet and then focused on Things. “This is Thing”, Bart explained. An orange super hero was shown on the slide. Then the gentlemen connected an electronic device with the Internet utilising IFTTT or IF This, Then That. This rule based web service was used to change the behaviour of the device i.e. flashing in the assigned colour in the assigned frequency. A Twitter message led to pink flashing LEDs laid out in a circle. It was cumbersome to connect with the smartphones of the attendees. Establishing the right connection for testing was really difficult. Was IoT really different from other systems under Test? There was no difference with GSM testing on a higher level: protocol testing was demonstrated by 3 processes impersonated by Bart, James, and Alex. Look at the differences in technologies. Find a way to address them. I hurried to catch my bus. I did not wait until the last one. This one was big enough for me.